The re-opening of the European skies means, among other things, a couple of days of quiet here at Bit Tooth, as I have now left home on a somewhat circuitous trip to the UK. Hopefully I will arrive on Saturday morning, by which time a lot of the major disruption should be over. Public debate will likely now center on who was to blame and for what. However as a follow-up to my earlier post on aircraft damage and the damage to fighters in particular, I do note that there are reports of two aircraft already having been damaged following the removal of the ban on flying, (H/t Admiral Valdemar) and that after Pinatubo erupted, aircraft damage was found in over 20 planes flying up to 1,000 km distant from the volcano. 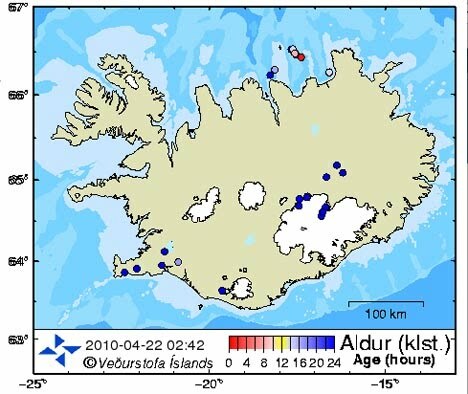 This is probably, barring a major change in Iceland, my last post on this topic for a while – I expect that it won’t come up again for about a year until there is an eruption at Katla or Laki, potentially about ten times the size of the current event, and that the whole issue will come back into the headlines. So I thought I would explain why I think that there will still be an eruption further along the rift line, and how, simplistically why I expect this to happen. Call it a summary of the posts to date if you will. Let me walk you through my thinking. 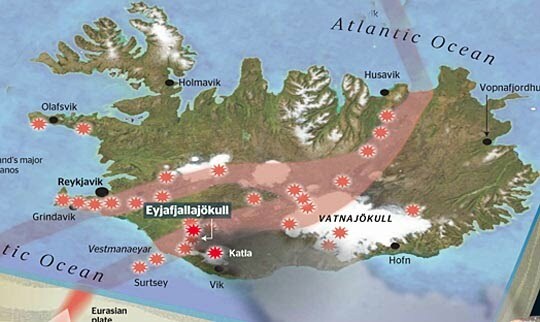 Iceland sits on the spot where the plates that comprise the shell of the Earth, are slowly moving apart. The plate edges are marked in pink, and by the line of volcanoes, in this graphic. 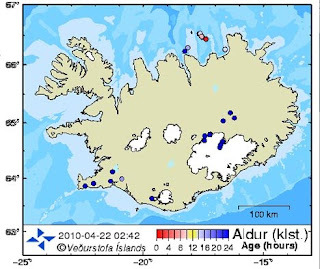 If you look at the Icelandic Met Office website, they show, every two minutes, where the latest earthquakes in Iceland have occurred over the past two days. Looking at the current picture, one can locate the earthquakes relative to the joint plane and the line of volcanoes. It is not however Eyjafyallajokul that has my interest. Let me try and explain why. The two plates which lie either side of the line of volcanoes are moving apart at a rate of about an inch a year. As theplates move apart they pull on the rock that sits between them, so that it splits and cracks, and emits the energy release from that fracture that we call an earthquake. As the splits grow they create a weakness plane along the fault line. Under the fracture zone there is a magma that will force its way to the surface, when it finds a weakness of fracture plane that is large enough to start the magma flow. Once the magma starts to flow it will open the fissure under pressure, and erode the walls of the passage until you get the standard round shape for the conduit that carries magma to the caldera where it is ejected. But the pressure of the flow also helps push the rock apart, and in the process can open adjacent passages in the rock under tension, allowing a secondary flow to establish. 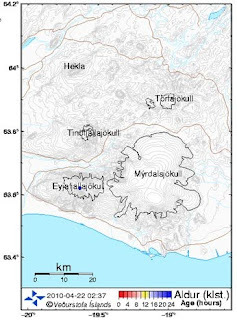 That will likely lead, within a year of so, to the more dramatic eruption of Katla, which sits under the Myrdalsjokull glacier. But there has been a lot of activity up around the north end of the larger glacier near the peak called Grimsfjatt. This is sometimes referred to as the Loki volcano. And this may be creating the circumstances for a rupture that will equate to that of Laki, which is currently quiescent. 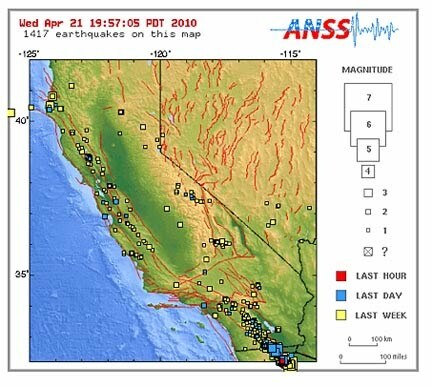 But stepping back a minute to look at the overall activities that occur when plates interact, what has been learned in places such as California, is that when the plates are moving together and not building up stress, then there are always a series of small earthquakes going on along the fault, as the ground accommodates the movement. It is only when the earthquakes stop happening in a region that the stresses start to build up. And the longer there is between quakes, then generally the larger the quake is that marks the end of the quiescent period. But those are compression/shear failures and movements. In Iceland the rock is moving apart under tension, with the added complexity of an underlying magma trying to escape through preferred fracture zones. 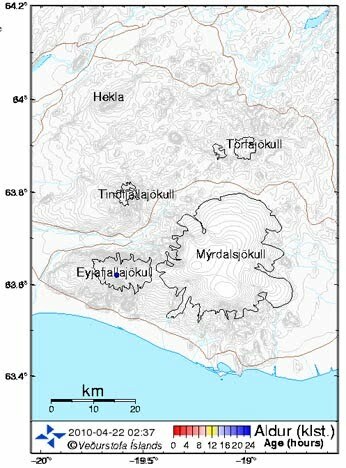 Yet looking at the current location of the quakes in Iceland, there haven’t been any in the zone between Myrdalsjokull and Vatnajokull. Now a) this is where Laki lies and b) having been only watching for just over a week, this may be building large sand castles out of very dry sand, but nevertheless it is a little bit of a puzzler, and so, based on three different thought threads, I suspect that while the current eruption may rumble on for a while, and fade rapidly from the MSM, sometime within the next 18-months Iceland will be back in the headlines, posing a much greater problem for Europe. Having said which, I’m still optimistic about getting into London this weekend, we shall see how it transpires.